Picture a space like a hostel dorm room with 10 different recesses with 3 bunk beds on the right and 3 bunk beds on the left for 60 bunks in all. Then add a narrow hallway (3 feet wide) where people can congregate. Add a tables and two fixed stools less than a foot wide outside of each of the recesses or door-less cabins. In the extra space in the hallway have someone bring a cart to sell you things periodically. Have a good mental picture? Add two hot water dispensers, two sinks and two hole in the floor style toilets. OK, now put this all in a train and you have a good picture of a night train in China. The night train is an interesting adventure. 60 people looking for personal space, 10 door-less cabins with some overhead and under bunk space for luggage. Each cabin also had a table and a TV that you cannot turn off nor turn down. It was showing Chinese movies without subtitles until about 10PM at night when it seemed to be showing heroes of the Communist Revolution as it played patriotic songs. Our tour group leader told us that the protocol was that the people who had the bottom bunk were expected to share them as a place to sit, but when the older women started to fluff the pillow and lie down we thought that was carrying the hospitality a bit far. We found out that there had been some confusion and she thought she was in her bunk instead of my wife’s. Once we clarified who was sleeping where some people climbed into their bunks because it was nice to have a space of your own, even if it was a small space. The width of the bunk was about the width of my shoulders and its length just long enough for my 6’ 3” frame. One of the two night trains we took had a small night light in addition to a clothes hook. By 10pm our train from Beijing to Xi’an grew quite except for the occasional food cart coming through and the random loud snorer (of whom I am one of the worst offenders). For some the gentle movement of the train lulled them into a restful slumber. For others the train car seemed to lurch each time they got close to falling asleep as if part of some cosmic practical joke. 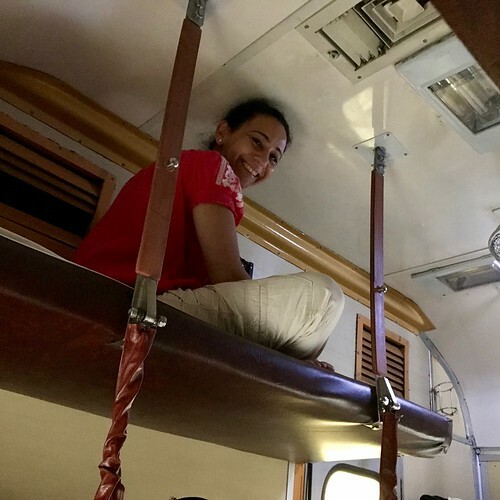 On our first train ride my wife slept soundly and I was kept awake but for some reason on our second trip the roles were reversed. In the morning people started to stir as the sun came up. They stumbled down the hall to the toilet and sinks or changed their clothes under their blankets in preparation for our arrival. Our tour group leader warned us that the toilets would be locked for the last 30 minutes of the trip. By that point in the trip you might have appreciated a hazmat suit to enter them anyway. Let’s just say that with a hole in the floor style toilet, aim is not improved by the movement of the train. I should add that there are also options for better and worse accommodations. The cheaper accommodation is sleeping in a seat while the more expensive is a cabin with a door and 4 bunks. When we learned that our tour included two night trains with only one night in a hotel between the two we were a bit apprehensive. When the second night train happened to be my wife’s birthday our uneasiness increased. But, it was an experience. I would ride the night train again in China if our plans called for it. My wife, however, will fly. Your post brings back found memories. I really enjoyed the trains in China. I tried the hard and soft sleeper and preferred the hard sleeper. The attempted interaction with my fellow travellers was priceless. I was lucky enough to always get a bottom bed not sure I could have made it into one of the top bunks. I carried around a piece of paper with the Chinese charters for hard sleeper and a baddy drawn picture of 3 beds with an arrow pointed at the bottom bunk. 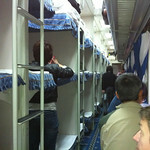 I would happily take a Chinese sleeper train over a Vietnamese sleeper bus any day. I love the last line- it gave me a good belly laugh! One of my favorite memories in China was riding the trains! I love the dorm feeling…and I met so many cool people on the trains! The funniest part was that I slept like a baby on the train. For 8 hours. My travel buddies thought I was dead because this never happens even when I am in my own bed. Sleeping in that train was much more comfortable than any of the hotels during our trip to China. Olga, was the bathroom less basic than the hole in the floor to the tracks? I think that was my wife’s biggest issue. Chris, it is hard to believe, but toilet was normal, not the hole in the floor. Bathroom was clean and even had toilet paper and soap. This was a train from Hanzhou to Quilin. I took some pictures ( not of the bathroom of course 🙂 ) just because i was so impressed. $80 for 19 hour long trip. 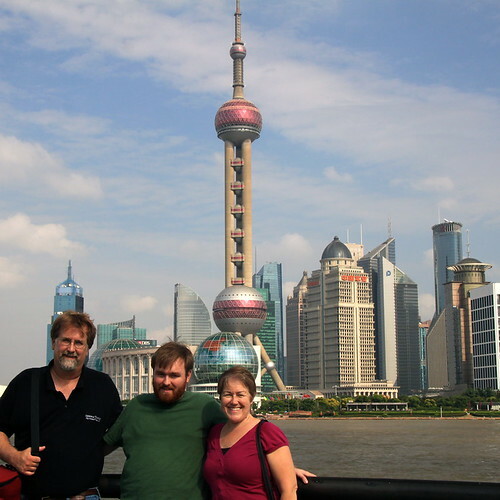 one of the tours in china I have been researching, mentioned a high speed train…..did you have that option? not a great experience for a solo traveler…. We took the high speed train from Xi’an to Suzhou. The high speed trains in China are a very different and great experience.